Follow us on Facebook for schedule details, program updates, on-air ticket give-aways, and photos of what we're up to at the station! Want updates regularly? Click here to subscribe to our newsletter or simply text WMNR to 22828 ! Q: I am a listener, why are you inviting me to be a broadcaster?! A: Most of our broadcasters were listeners before they were broadcasters! 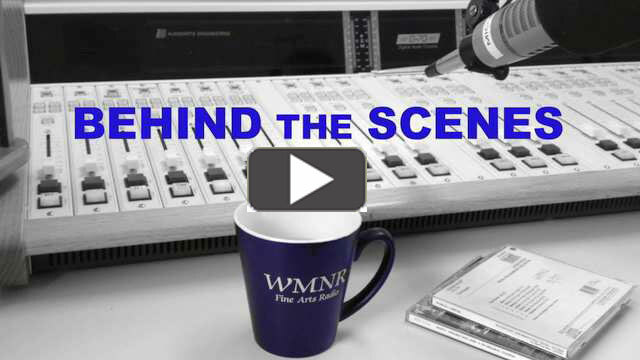 To celebrate our 30th Anniversary, WMNR Fine Arts Radio produced a video featuring 27 broadcasters and staff. The piece is a loving tribute with an inside look at the people who make up the station. Produced by WMNR’s own H. William Stine, with Associate Producer Megan Stine. After Bill and Megan produced the Anniversary video, they teamed up again for a slightly less serious, but completely accurate, look at our broadcasters. To view the videos, click the picture.